Someone like me has followed the Fins since 1970 and I've seen all the players. So, when I think of the Dolphins, I think of Marino and Csonka. I'd hate to see anyone wear either of those two numbers. I think only #13 is retired, and no one is passing out #39. Man Dave , I think of Manny Fernandez. I guess we are old. I'm the same way,so don't think we are old just more seasoned that's all...lol and as for as the #39 goe's just think they don't five it out to a player as respect for Him. Look we all have diff fav players out there,some like the JT and Zack attack,while some of us rember the killer B's,or the Marks brothers. 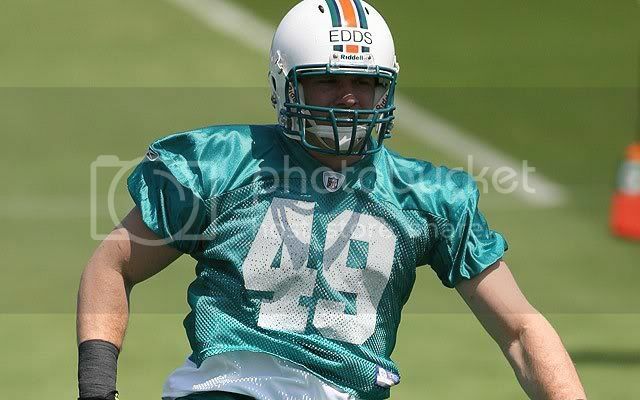 Or 1 of my fav is F.Edmonds the all pro (te) we had before K.Jackson. So diff #'s means diff things to some ppl. But come on we all should know that nobody and I mean nobody should wear #13 or #39. UPDATE: Edds is wearing No. 49 today, not 54.
still say start him off with #56 then work his way up to #54........for you young guys out there #56 was J.Offerdahell. Yes, but you don't give the No. to a late-round rookie coming in trying to earn a spot on the team. You give it to an established player or high draft choice. There is a reason he's not wearing it today. From today's rookie mini camp. It's a requirement of Iowa linebackers. They don't run any sort of nickel package and stick with a 4-3 essentially the entire game. Norm Parker believes his LB's can cover any sort of spread...unfortunately, most years we get burnt when playing OSU and Northwestern.